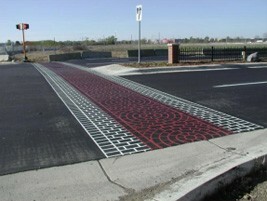 Decorative Pavement Marking matches innovative project design with innovative products. From practical advice and design knowledge that will save you money on installation, to the skills and expertise of our talented artisans. We provide total solutions delivered on time, on budget and to the highest standards. 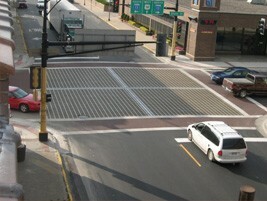 The use of their special process and materials has provided us with not only a safe crosswalk but an attractive one as well. 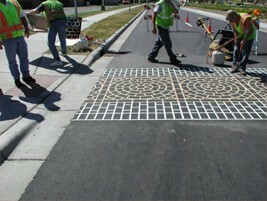 Decorative Pavement Marking is to be commended for a job well done and for helping us keep our children safe. We saw average vehicle speeds come down several mph which is a big impact. Thanks again for your help on the project! View a slideshow of several of the projects we have done over the years. You can also click on the view more link below view more images and project specific details. 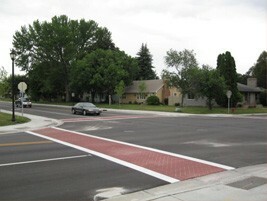 Click here to also learn more about the Minneapolis Safe Routes to School median project.